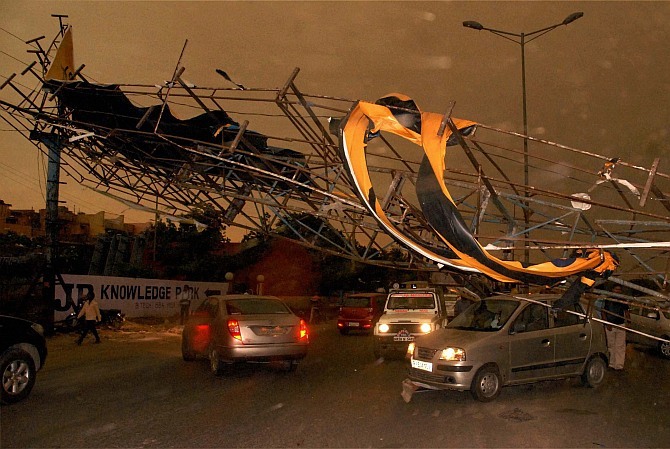 The death toll in the powerful dust storm has increased to 14 even as many areas in the New Delhi remained without electricity for over 24 hours due to delay in restoration of damaged power transmission lines. Some areas in the city faced severe water shortage as a number of water treatment plants could not function at optimum level due to long outages. Power supply could not be restored in various areas of West Delhi till evening. A senior power department official said a total ten transmission towers of three major lines -- Mandola-Gopalpur, Bawana –Rohini Line and Bamnauli- Pappankalan-I -- have been damaged in the storm that had struck at around 4:58 pm on Friday. "Since it will take time to fully restore these lines, efforts are being made to supply power through other alternate routes. Discoms have been advised to judiciously rotate load shedding," the official said. 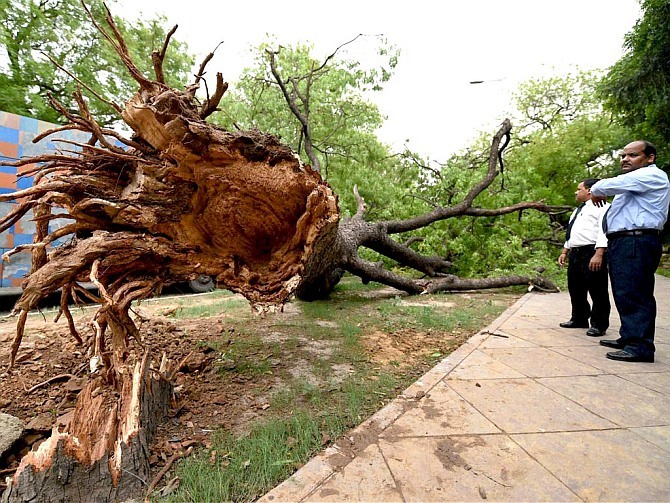 Police said a total of 14 people died and over two dozen were injured in various areas of the city in accidents like felling of trees, collapse of walls and electrocution. 48-year-old man died of severe head injuries when a hoarding fell on him. A 35-year-old tempo driver was killed in Naraina area in South West Delhi when a wall collapsed on him. An 18-year-old girl, identified as Aasha Malik, was also killed in the area, police said. Malik died when a boundary wall collapsed on her around 5.15 PM. She was rushed to Rao Tula Ram Hospital where doctors declared her dead on arrival. 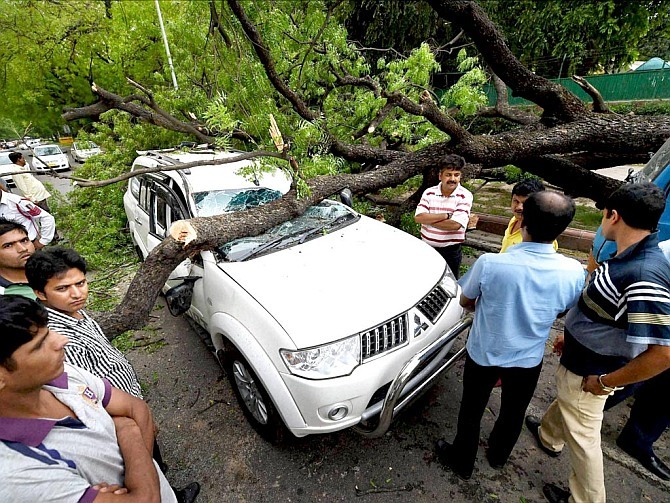 In Central Delhi, a 24-year-old cab driver died after a tree fell on his car in ITO area while another man died in similar fashion in Chandni Chowk. 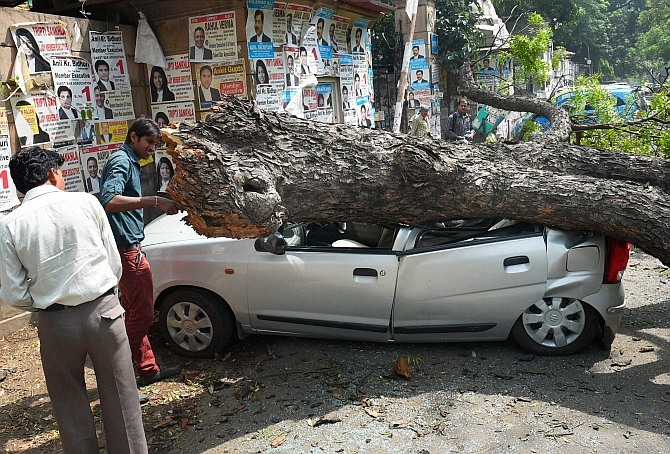 In North Delhi, a man identified as Younis was killed after a tree fell on him Kotwali area while another man was killed in Civil Lines area after some portion of a building fell on him. The most tragic of all the incidents took place in East Delhi's Vivek Vihar area where a 17-year-old boy identified as Anu was killed when a tin sheet slit his neck and then hit his 51-year-old mother's head leaving her injured . "The boy was killed as his neck was slit with a tin sheet. His mother is okay now and she has returned home," said Deputy Commissioner of Police (East) Ajay Kumar. At the IGI airport, a 44-year-old man died in the apron area. "The cause of his death is not clear. He was found bleeding from his nose, one of his ribs was broken. He worked as a cleaner and hailed from Luck Sarai in Bihar. The exact cause of death will be known after the post mortem report," said Deputy Commissioner of Police (IGI) Airport) M I Haider. One person was also killed in South East Delhi. Meanwhile, Delhi's Lt Governor Najeeb Jung directed Divisional Commissioner's office to survey and assess damages to life and property caused by the dust storm and provide ex-gratia or relief to the affected families. Jung also instructed the Delhi Jal Board (DJB) authorities to supply water in tankers in the affected areas immediately.